United States Navy. Born in Princeton, New Jersey, on May 7, 1774, Bainbridge began his sea-going career at 14 in the merchant service and became captain of his own ship within 6 years. Bainbridge joined the naval service in 1798 as a lieutenant, becoming part of a group of young officers known as “Preble’s Boys.” Under the leadership of Commodore Edward Preble, these young patriots dared to challenge the French, the Barbary Pirates and even the world’s most formidable naval force, the British Royal Navy, in the defense of their young nation. As captain of the schooner RETALIATION, his first naval command, Bainbridge was forced to surrender to a superior French force but successfully negotiated his own release and the release of more than 300 other captive Americans in exchange for fewer than 100 French prisoners. small warship, the PHILADELPHIA ran aground just outside the harbor of Tripoli. Surrounded by a number of smaller and more maneuverable ships, Bainbridge surrendered rather than risking the 307 lives of his crew. The PHILADELPHIA was re-floated by the pirates, but was blown-up in February 1804 during a daring raid led by Lieutenant Stephen Decatur. Bainbridge helped plan this daring maneuver through the use of ciphered messages sent while imprisoned. Bainbridge’s greatest achievement was his victory over HMS JAVA on December 29, 1812, off the coast of Brazil while captain of USS CONSTITUTION. Old Ironsides, the ship’s enduring nickname, is the oldest commissioned U.S. Navy warship. Berthed in Boston, Old Ironsides continues to carry a replica of HMS JAVA’s wheel, which was removed from the hulk following the battle and used as a replacement to Constitution’s own destroyed wheel. During the battle, Bainbridge led his sailors to victory despite being twice wounded. Excerpts of Bainbridge’s own harrowing account of the battle are presented on the facing page. Commodore Bainbridge later commanded the Naval forces of Boston where he supervised the construction of USS INDEPENDENCE, the United States’ first ship of the line, the era’s equivalent to an aircraft carrier. In 1820, he returned to the Mediterranean as a squadron commander aboard USS INDEPENDENCE. 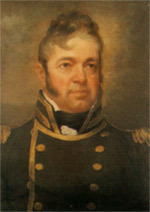 Upon his return, he was Commandant of the Boston Navy Yard, Naval Commissioner between 1825 and 1828 and Commandant of the Philadelphia Navy Yard. Bainbridge was posted back to Boston for what became his final tour of duty. He died in Philadelphia on June 27, 1833, after ill health forced him to leave naval service. 2:30 : our wheel was shot entirely away. 2:50 : the enemy’s jib-boom got foul of our mizen-rigging. 3:00 : the head of the enemy’s bowsprit and jib-boom shot away by us. 3:05 : shot away the enemy’s foremast by the board. 3:15 : shot away his main topmast just above the cap. 3:55 : shot away his mizen mast nearly by the board. 3:40 : shot away gaff and spanker boom. 4:20 : the enemy’s mainmast went nearly by the board. 4:50 : wore ship and stood for the enemy. 5:25 : got very close to the enemy. . . when he most prudently struck his flag,… as he laid an unmanageable wreck upon the water. 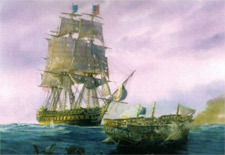 The JAVA was an important ship, fitted out in the completest manner, to carry lieutenant general Hyslop and staff to Bombay, and several naval officers for different ships in the East Indies, and had despatches for St. Helena, Cape of Good Hope, and every British establishment in the India and China seas. She had on board copper for a 74 and two brigs building at Bombay, and I expect a great many other valuables; but every thing was blown up in her except the officers’ baggage, when we set her on fire at 3 PM on the 1st of January, 1813, nautical time.